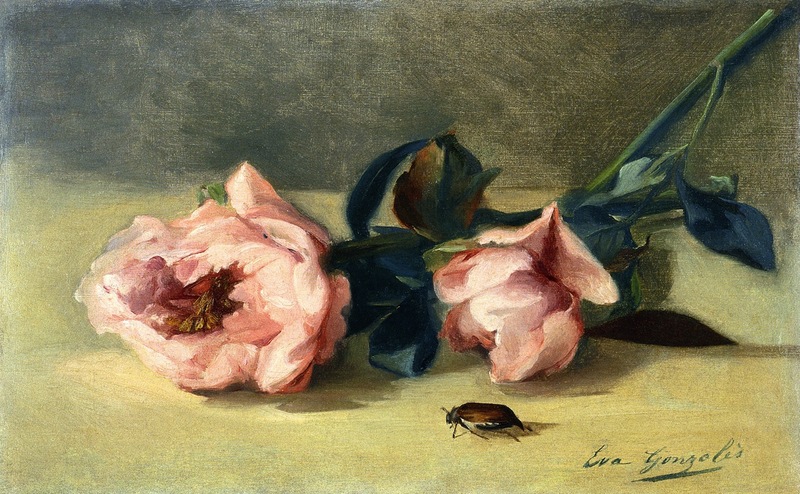 Random Noodling: Poetry Friday--Ekphrastic April, Day 27: "Peonies and June Bug"
Poetry Friday--Ekphrastic April, Day 27: "Peonies and June Bug"
"Peonies and June Bug" (1871-1872) by Eva Gonzales [1849-1883]. Since we're finally moving into warmer weather here, I'm looking forward to the trees, plants, and flowers playing a little catch-up. Before we know it, it will be peony time. And June bug time. People write poems and songs about the oddest things. The June bug is one of those oddities and appears in a song by the B-52s. The swimming bug in the video is definitely a carnivore, but the June bugs I'm familiar with are vegetarian. "June Bug" appears on the album Cosmic Thing, which was released in 1989. I was a children's librarian at the time and one of the story hour families gave me the CD for Christmas. I can honestly say it is the BEST job-related gift I ever received. I played it for years. I can no longer remember the name of the gift-giver, but I'm forever grateful for the gift. Irene will be sharing the gift of poetry today at the Round-Up being held at Live Your Poem. Irene, too, has been writing ekphrastic poems this month. I do love peonies...and always despair when they get bug ridden. Their season is far too short! Never heard the B-52's June Bug song. Odd but very catchy :). And I didn't know there were carnivorous June bugs! Wow Diane I have a new appreciation for the June bug–that's some video. You caught the cut peonies story well in your cherita, lovely image by Eva Gonzalez too, thanks! What an odd song - but it's just more proof that inspiration sometimes comes in the unlikeliest of places! I remember having those peonies crawling with ants in Missouri, but rarely are they that way here. Still, I prefer them on the bush, though I have to use a frame to hold their heavy heads. We don't have June bugs here. I must admit that we used to catch them (in Missouri) & tie thread to them, run with them flying. We did release them later, FYI. You've brought back some memories, Diane. I remember June bugs from when I was little and lived in a much more arid climate than now. I wonder if they don't like the rain? Our peonies won't bloom for at least another month, but I know how quickly they do fall apart, which makes this so touching. Our peonies are poking up, reminding me it won't be long! I'll think of your poem as I admire them swaying in the yard. Since I love peonies so much, I had the gardener plant a bush in my garden. I just love watching it grow. Calling your poem fragrant June reminds me of the smell of my garden when the peonies bloom. I don't recall ever seeing a June bug Diane or maybe I just don't know what I am looking for. Thanks for the video and of course the poem. I was sharing your site with another group of teachers this week. One question from an English teacher: why do the haikus not have capitals? I posted my invitation to my spring gallery and thank you in advance for always contributing. Fantastic blast from the past! The B-52s juxtaposed w/ the still life painting creates incongruity. Your poem is superb, and it also illuminates the painting, especially that line about the dinner growing cold. Wonderful blast from the past listening to that poem set to music while looking at the nature photos. And that gold lame suit. Priceless. Here the ants devour the peonies.